>You can tell I’m in THAT stage of novel-making by the state of my house. My housekeeping skills have never been of the white-glove variety, but I do like to have things in their place. Now, however, there are dirty tennis shoes and dog toys under the Christmas tree, stray bones and eyeballs and pumpkins from Halloween on the kitchen counters, random half-created gizmos and art projects hiding here and there. These are the products of sharing living space with a bored aerospace engineer and crafty pre-adolescent girlchild. I must confess, however, that one of these bits of weirdness is mine — this one right here, the sheet of graph paper adorned with a Wild Kingdom of tiny plastic creatures. It sits right where the centerpiece used to be on my dining room table, and I am afraid that’s where it will continue to sit for the next month or so. It represents the opening scene of Book Two, the murder that must be solved by my intrepid protagonists. This scene is dense with characters both major and minor, both heroic and villainous, moving about a tight limited space, seeing only what they’re supposed to see, so that the murder will be a Mystery and not an Omigod So-and-So Just killed So-And-So! (because that would make for a lousy mystery novel). Pulling this off was providing ridiculously difficult. I couldn’t remember who was where, much less keep track of what they’d seen. So I decided to stage the scene in 3D, with my setting drawn out (badly but efficiently) on some graph paper. Then I picked out little plastic critters from my daughter’s toy chest to represent my characters. That’s Tai, my sleuth, played by a frisky red fox. And there’s Trey, my hero, represented by a kinda pissed-off looking black bear. 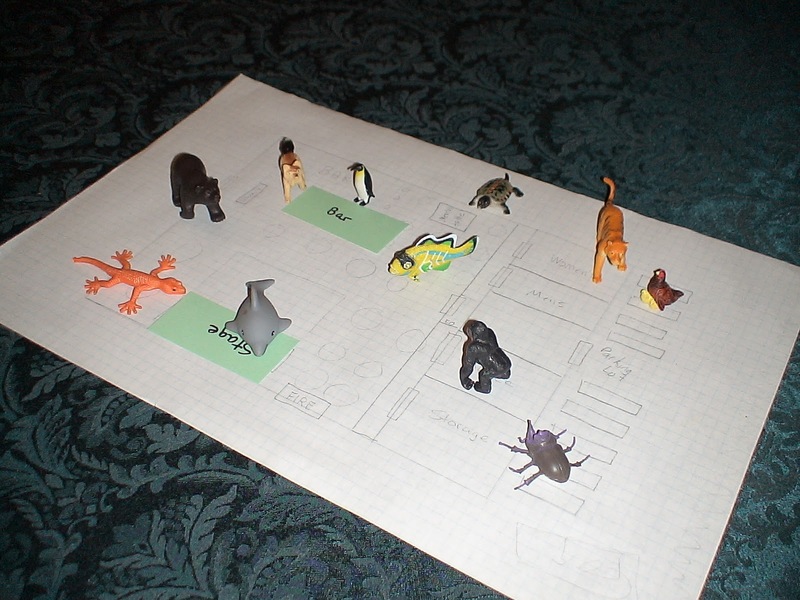 I chose a dung beetle to play my odious bad guy/victim, then threw in a lizard, a dolphin, and a deceptively innocent-looking chicken as suspects. The role of the red herring is played by an ornamental carp. It felt silly to start with, but then I realized how many plot holes I was uncovering as I moved my characters around in real space and time. Who would run into whom in the hallway. Who could eavesdrop. Who I had in two places at once (oops). All of which saved me a ton of re-writing. Wild Kingdom meets Clue is still set up on the dining room table. I’ll have to move it before Christmas dinner. Or maybe I’ll just throw some holly on top of it and call it decoration. Either way, I think I’ve found a new tool for my writer’s toolbox (which is getting more eccentric by the day). >This is a genius idea!!!! >Dung beetle did it in the library with magic fairy Barbie wand. >Wild Kingdom meets Clue. LOVE IT! I'm so looking forward to your book!!!! !